Thank the person who presented you with award. Share an awkward, embarrassing and intimate in 100 words or less. This is a very special award to me! And its the most special of all the awards of you may receive today! Teri from the Narcissist Blog came up with this great idea to make the snazziest award under the sun, and I was so excited to get to collaborate with her to make the image to correspond with it! I hope the good people of the internet Enjoy this award! I’m a very awkward creature so, this is really hard. Once at my friend’s graduation I realized the sidewalk was a bit uneven. But it was more convenient than using the grass while and I was in heels. So I proceeded, telling myself to be wary of my steps… and then it happened, my heel was caught in the sidewalk. I slowly realized I was stuck as I tried to step forward and started to fall. Now there were people close to me, who gave me no aid in not hitting the floor. The next thing I knew my dress was all up in the air, my purple leopard underpants were all up on display and this middle-aged man with teenage kids said “Oh wow, that is so embarrassing.” Then of course when I went to find a seat, they were only a few chairs away talking about how embarrassing it was, as I was dusting sandy gravel from my person. And then I went to a graduation party looking like I had just been in a stage production of “Street Car Named Desire”… all disheveled, with bloody knees, and a partially ripped dress. It was the nicest way to meet your friends family… Party on, bloody legged girl! Modern Women’s Society -My DNA tested internet Twin! Hot damn! Like I’ve already said, when I got your message, I sat in my little chair….too excited to click on your link. Eeeeeee! Cannot wait! I know you will probably have a deliciously awkward story! I just posted mine too! Yay us! Your list is great btw. I’m so happy. I could throw glitter in the air and dance like RuPaul taught me! Thanks again for including me in this! I thought you’d appreciate it. I hope you have fun with it. I love your blog and your awkward moments. I mean at least you can laugh about them … NOW and we are entertained in the process. My life is one big TMI-fest. Thank you so much for bestowing this upon me. This award truly fits everything I’m about. I figured you would enjoy such an award! Make it a really good story!!!! Awesome! Hey, that’s me up there! 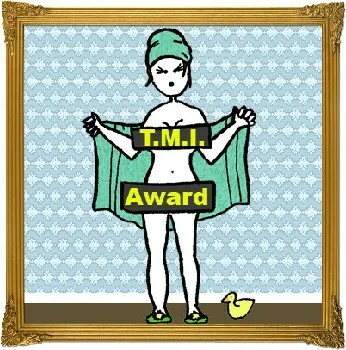 Well your blog is all about TMI in the best way! Congratulations and thanks for being awesome!